When the first Biergarten (beer gardens) started popping up in Germany’s Bavarian region in the late 19th century, who would’ve thought that they would one day come to represent summer in Japan. Well, I guess it’s not that unbelievable. These days, with so many beer gardens to choose from across the country and consumers continuously demanding something new and exciting, beer garden operators have to be creative in order to come up with a fresh way to grab attention. 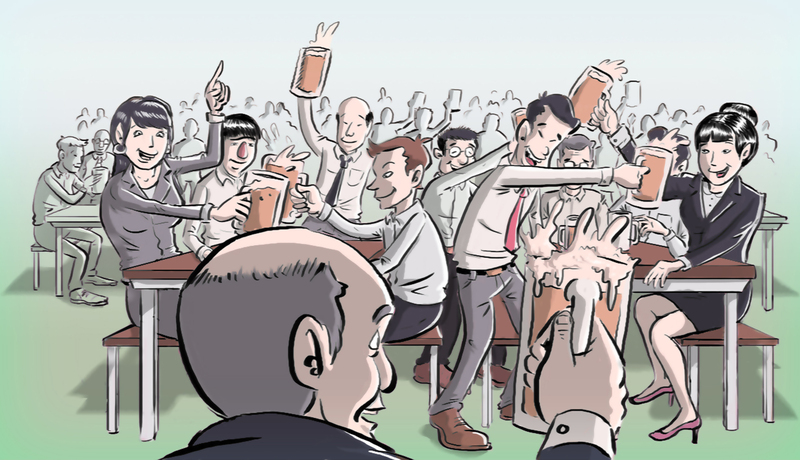 Many people will find themselves at a beer garden at least once this summer, since they’re a big part of the after-work drinking scene in Japan during the warmer months. More often than not, they’re located on the roofs of department stores or the middle of a park, but the real question is which one to settle on with the variety available. Keep in mind, payment methods differ at beer gardens. Some require customers to pay ¥3, 000 to ¥5,000 for an all-you-can eat and all-you-can-drink experience, but some will allow people to pay less and settle with one or two drinks and a snack. One of the best beer gardens in the capital is the New Tokyo Sukiyabashi Main Store rooftop beer garden. The ¥4,800 price tag may seem steep, but if you have a big appetite and a strong tolerance for alcohol, the all-you-can eat Ghengis Khan barbecue and the unlimited pitchers of beer are well worth it. The place is popular among company employees working around Marunouchi or Ginza and it may be hard to grab seats on a weekday evening, so heading there early is the best bet. Other great beer gardens include the Kaze to Midori no (Wind and Greenery) Beer Garden outside of Tokyo Dome. The course (¥3, 900) is pretty standard with French fries and sausage links on the menu, but the upside is that you can watch sporting events live on a large monitor. On a side note, sports fans in Hyogo Prefecture can also combine their love of beer with baseball on June 28 and 29. There will be a two-day beer garden outside of the Hanshin Koshien Stadium in Mizuno Square from 11 p.m. to 3 p.m.
For Tokyoites willing to make the trek, there’s also a beer garden out on Mount Takao in Hachioji. The area has a prime view of the city lights below — just don’t forget to wear a pair of sturdy shoes. The biggest and best beer gardens in Japan aren’t necessarily in Tokyo. The largest is in Sapporo and is open from July 18 till Aug. 15 in Odori Park and it claims to have 13,000 seats available. Unfortunately, there’s no all-you-can drink option, and the cost of ¥530 mugs of Sapporo will begin to add up, so this beer garden might be best for light drinkers. Other notable beer gardens in the north can be found on the rooftop of the Mitsukoshi department store in Sendai, which is promoting its European-inspired menu this year. Each month, though, the store says it will change up the menu. For those living in Kanagawa Prefecture, or can make the trip from Tokyo, Beach House Kula is holding a beer garden right on the beach between Kamakura and Enoshima. Here patrons can pay ¥4, 860 to barbecue on the beach and drink as much as they want for 2½ hours. While reservations are necessary, customers can choose one of the slots from before noon and spend the rest of the day on the beach sleeping off their meals. For those living in Osaka, the Umeda district has many beer gardens to choose from. One of the most noteworthy ones is the Hankyu Top Beer Garden on the roof of the Hankyu Terminal Building. While beer gardens usually place a time limit of around 90 to 120 minutes on drinkers, the Hankyu has no time limit and will let patrons eat and drink as much as they want for ¥4,000. Finally, beer garden enjoyment is readily available all the way down south in Okinawa Prefecture, and it’s only natural that most of the beer on tap is Orion, whose breweries are the fifth largest in Japan and are based in the Okinawan city of Urasoe. Also interesting, the prices for beer and food at some of the places I checked out tended to be cheaper compared to the rest of the country. One place in particular to head to is the Palette Sky Beer Garden in Naha, where customers can enjoy a glass of Orion draft for ¥400. Beer gardens may have originated in Germany, but Palette’s menu focuses on the taste buds of Okinawans and the hot weather — start the weekend with beniimo (sweet purple potato) and sour shikuwasa (hirai lemon) ice cream, both on the menu at ¥300 each. 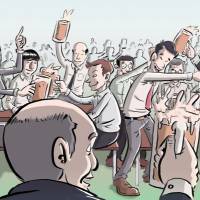 Most drinking holes are thought of as cramped places that are packed with sweaty salarymen trying to unwind after a long day at work. Beer gardens, however, are more balanced when it comes to the sexes. A few trendy venues, though, are popping up around Japan to cater even further to the demands of their female clientele, who tend to want a classier environment and something healthier on the menu than a pint and some greasy pub grub. One such place is the Utsukushikunaru Beer Garden, which is literally rendered in English as “the beer garden that will make you beautiful.” Located on the rooftop of the Matsuya department store in Tokyo’s glitzy Ginza neighborhood, the beer garden is high up enough to catch a cool breeze during Japan’s humid summer months. There are a wide variety of fresh vegetables that come in every color of the rainbow and the pieces of chicken are lean, which is much better than the usual deep-fried bits and bobs. If you want to cheat on the diet and satisfy your sweet tooth, Utsukushikunaru Beer Garden serves bowls of shaved ice topped with fresh fruit — not exactly cheating, is it? The real icing on the cake comes in the form of the young, fairly attractive men who have been hired to serve the food. The VIP service is an extra ¥5,000, but you get a personal butler at your table to do your bidding. On Fridays, visitors to the beer garden are also treated to a free hand massage. Another beer garden that’s aiming to be popular with the ladies this year is the Aloha Natural Hawaiian Beer Garden. It’s located in the Ikebukuro and Kichijoji branches of the Parco department store in Tokyo, in the Chiba and Tsudanuma branches in Chiba Prefecture, in the Utsunomiya branch in Tochigi Prefecture, and in the Shizuoka branch. As with Utsukushikunaru, the Hawaiian-themed menu is also rich in fresh vegetables, while the beach chairs and sofas make you feel like you’re staying at a resort — just at a much cheaper price. Over in Osaka, the Hankyu department store’s Umehan Beer Garden Marche is trying to attract female customers who dislike beer by offering more than 50 different cocktails on its drinks menu. The choices include everything from sparkling wines to nonalcoholic juices and frozen drinks.